RIO DE JANEIRO, Jul 3 2013 (IPS) - The Brazilian national football team made a glorious comeback with its victory in the FIFA Confederations Cup, but the sport has lost its tight grip on society. While millions celebrated, the tournament was also another source of anger for the protesters that have filled the streets in the last few weeks. “There will be no Cup,” chanted thousands of demonstrators, referring to the FIFA World Cup due to be held here in 2014, as they marched near Maracaná stadium in Rio de Janeiro, where Brazil defeated Spain 3-0 on Sunday, winning the tournament for the fourth time between the champions of the seven regional FIFA confederations. The stadiums that were built or renovated for the Confederations Cup and World Cup matches were transformed into fortresses, besieged by protesters and the site of pitched battles between police and demonstrators over the past two weeks. Rubber bullets and tear gas were the main weapons used by the police against demonstrators, some of whom threw stones, Molotov cocktails and fire crackers. The sporting events inside the stadiums were also affected. At the inauguration of the Confederations Cup on Jun. 15 when Brazil played Japan, Brazilian President Dilma Rousseff was roundly booed. At subsequent matches involving their team, Brazilian fans sang the national anthem at the top of their voices, and rebelled against the FIFA rule limiting the playing of anthems to 90 seconds by continuing to sing beyond the set time limit. A banner calling for the “immediate annulment of the privatisation of Maracaná” was displayed in the centre of the stadium by a couple of volunteer dancers at the closing ceremony on Sunday. Similar actions broke the rules banning political demonstrations at FIFA events. Stadiums are among the main targets of the protests that have brought more than two million people out on the streets throughout Brazil since Jun. 6. Corruption and the use of resources that the demonstrators say should be spent on health, education and public transport were the main reasons why people have rejected the international tournaments. The general belief is that some stadiums will be “white elephants” after the FIFA World Cup in 2014. One example is Mané Garrincha, in Brasilia, a stadium that was demolished and rebuilt with a seating capacity for 70,000 spectators. According to observers, the country’s capital, which lacks a football tradition and has no important football clubs, will not be able to use such a large stadium, which is second only to the historic Maracaná, with capacity for 76,800 fans. Matches between the eight national teams that participated in the Confederations Cup in June were played at six stadiums, while 12 stadiums will host the World Cup between Jun. 13 and Jul. 13, 2014. The cost of construction, which is already seen as exorbitant by Brazilians, is still rising. The initial budget of 2.4 billion dollars for the 12 stadiums has already increased by 30 percent, according to the Comptroller General’s Office (CGU). But costs may continue to rise, because the projects are a long way from completion and are experiencing considerable delays. Moreover, works to improve urban passenger transport for the crowds of visitors expected next year are needed. Many are convinced that corruption is the main reason for inflated costs. The luxuriousness of the new temples of football is another complaint. Poor people are being excluded from the sport that they have for so long supported, due to the high cost of entrance tickets. The level of quality insisted on has become a satirical reference in the protests raging in the streets of the country’s largest cities. “We want FIFA standards” for education, health and other services, like public transport, demonstrators are demanding. FIFA has become “a state within our state,” and is today “the country’s real president,” said former football player Romário de Souza Faria on a video uploaded on the internet in support of the protests and criticising the impositions of the world football organisation. Romário, the hero of the Brazilian triumph in the 1994 World Cup in the United States, is now a congressman for the Brazilian Socialist Party (PSB). The only country that has ever renounced hosting a World Cup was Colombia in 1986. The tournament was transferred to Mexico. The then Colombian government rejected FIFA’s conditions on the grounds that the resources would be better spent on education, health and other areas of social development. However, these promises were apparently not kept. In recent years, People’s Committees have been formed in the 12 state capitals that will host the official matches, to denounce the impacts of the 2014 World Cup and mobilise the population against it, especially those people who are affected by the construction works. In Rio de Janeiro, in particular, the protests are aggravated by the Olympic Games to be held there in 2016, and the lesson learnt from the 2007 Pan American Games, which cost four times the original budget and left a legacy of next to nothing. 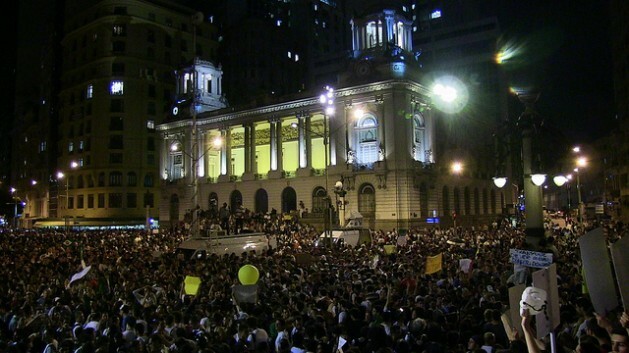 The committees headed demonstrations that, together with the marches against bus fare hikes – later cancelled – in São Paulo, unleashed an unprecedented wave of protests that shook Brazil´s political institutions and highlighted the crisis of representation by parties and the legislative and executive branches. The Confederations Cup and the bus fare increases acted as detonators of a generalised uprising when they coincided in June. The protest is not against football, but against corruption and the use made of public resources that are needed in key social sectors, the demonstrators´ placards explain. But the stereotypical view of Brazil as “the land of football” is gone. More important than winning the World Cup is having better public services and government, and less corruption, said the protesters, while President Rousseff’s popularity plunged from 57 to 30 percent in June.